The world, so they say, has become a smaller place, networked and and virtualised, a village the size of the globe. This is, I guess, a good thing, for the most part anyway, but only willful blindness would stop us from noticing that something is missing. Maybe it’s the way people listen to their iPods, isolated in a musical bubble; maybe it’s the way people – myself included – are almost surgically attached, cyborg-like, to their smart phones. Somewhere along the line the world got closer together, and we reacted by retreating into our personal space. It’s ironic when you think about it. Back in October 1960, on a Thursday long before anyone had really dreamed of iPods, a song was recorded. 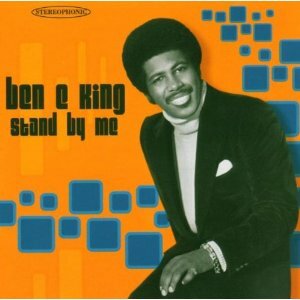 Based on an old spiritual and some verses from the Bible, ‘Stand By Me’ made Ben E. King’s name as a solo performer. It’s a gorgeous song, with a bassline that you never forget leading you into an almost mythic dimension – even in the depths of darkness, even if skies and mountains fall, loyalty and love are still possible, now until the end of the world. Fear’s something that we see a lot of, in tabloid journalism and cab driver conspiracy theorie, and it defines us more than we’d like to let on. Asking us not to fear may sometimes feel like asking us not to breathe, but it doesn’t have to be like this. We can unite, talk, sing songs, tell stories around acampfire lit to ward off the darkness. We can stand together – you, me, friends, families, lovers, God – stand together and not be afraid. We may have to turn off the iPods and put down the smart phones to engage with the people, the communities, the world around us, but it’s worth it. Happy birthday, Ben E. King. This entry was posted in Culture, Life, Music, Pop Culture and tagged ben e king, culture, jerry leiber, leiber and stoller, life, mike stoller, music, pop culture, pop music, songs, stand by me on September 28, 2011 by Matt. This is one of Li’l D’s bedtime songs. I hope he’ll associate with it the same sweetness I long have. Everything is easier when taken together with the knowledge someone is in fact standing by . . . Stand By Me, Ben E. King. Thank you for your heart reaching, beautiful song. I’m wondering who wrote this essay.